This is a bit late, but Gallery 1988 had a show dedicated to comedy. Each artist was assigned a different comedian and it was up to us to translate them in our own unique style. 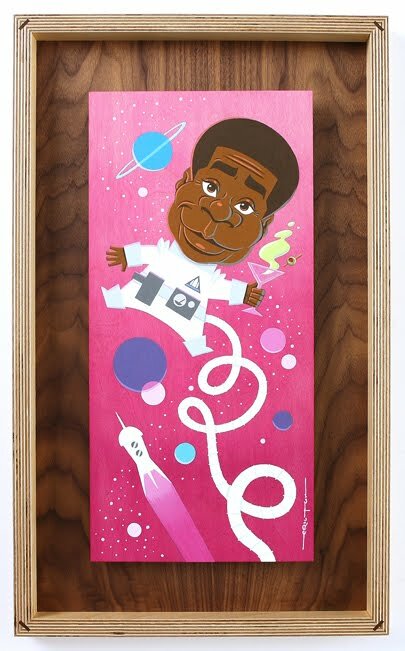 I've been a fan of Tracy Morgan ever since he was 'Hustle Man' on the Martin show so I was pretty damn excited when i was paired up with him. One of the few times I've pissed my pants watching television was when Tracy busted out his 'Astronaut Jones' character on SNL. It's a really simple sketch but the endings were always killers. I think I knew immediately that I wanted to do an "Astronaut" piece. This was done old school style, with acrylic paint on a wood panel. It was fun to paint again after living life on the computer for so long. A HUGE thanks to whoever ended up purchasing the painting. Your contribution to the 'Eric Tan art supply & framing fund' is greatly appreciated! Here's my entry for Gallery 1988's 'Multiplayer' video game-themed show at their new Venice location which opens Saturday, January 15th. I think my passion for video games really sparked up again when the Nintendo Entertainment System was launched. My brother and I snatched up the system that came with ROB the robot and two games, Gyromite and Duck Hunt. As cool as the idea of a video game-playing robot and spinning gyros balancing on red and blue buttons seemed, we immediately came to the realization that Gyromite was damn near impossible to play. We ended up throwing the robot aside and pounded on the red and blue buttons with our fists in frustration. You can finish that game pretty fast that way! Most of our time was then devoted to Duck Hunt. There's no better way to get kids into firearms by making shooting things fun with a game like Duck Hunt! We spent endless hours shooting green and pink ducks, white clay targets, and throwing the actual gun at the condescending dog when he'd laugh at you for missing. So when it came time to create a print for a video game that held fond memories for me, Duck Hunt was a no-brainer. 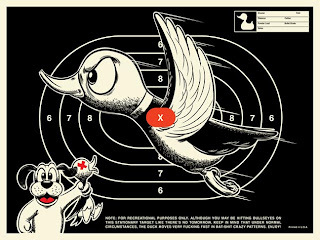 I always had the idea of creating a practice target featuring the duck from the game that I'd actually shoot at a range. Putting a bullet through your own art is kinda sacrilegious, but this is one case where i thought it was appropriate....and unique. My friend Danny let me use his 9MM handgun at a gun range and i went to town on about half of the prints. I hit a few bullseyes here and there but I found out that the real thing is way harder than the video game. Unlike the game, you can hit the ducks at point blank range by putting the gun directly on your TV. Here's a video of me at the range. If you notice, I flinch after the first shot. That's a result of a scorching hot shell hitting me in the head. Yup, it definitely is a much different experience than that video game! Hope to see you at the show!